Our new “Focus On” series highlights special ingredients or tips to help with your cleaning projects. This post focuses on the handy ingredient: vinegar. 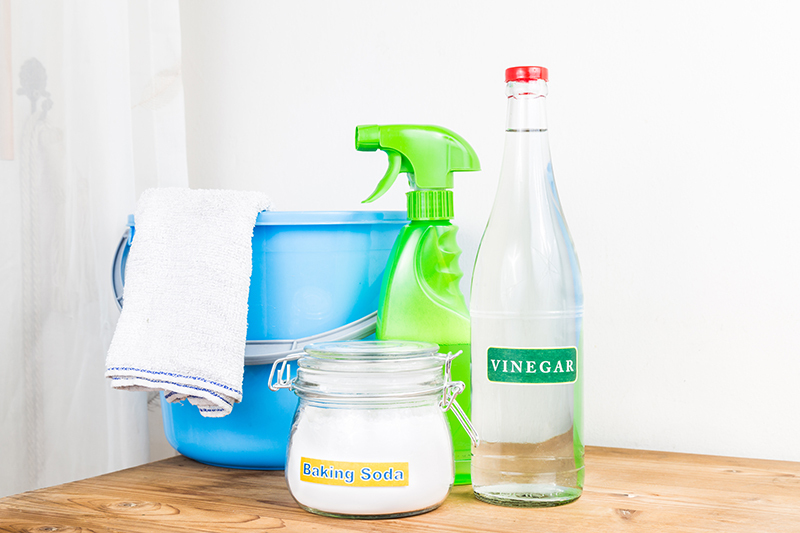 More and more people are moving back to natural, chemical-free cleaning solutions, and there aren’t a lot of supplies that are more useful or inexpensive than plain white vinegar. sing chemicals around your food increases the chance of contamination. Use equal parts vinegar and water and wipe the shelves and walls of your fridge. Vinegar kills germs, mold, and mildew, breaks down old food spills, eliminates bad odors, and doesn’t leave streaks. Place a tray of ice cubs in the disposal and as you turn on the disposal, pour a cup or more of vinegar into the drain. The ice mixed with vinegar will help clear out the gunk and kill bacteria. Pour a cup of vinegar in the toilet in the evening and leave overnight. In the morning, sprinkle some baking powder and scrub; then flush. Spray vinegar on the tub and drain and let sit for several hours. Scrub to clear away debris. Rinse away any leftover debris. Then apply vinegar again to any mold-prone areas and leave on to dry. Add ½ cup vinegar to a gallon of water and use the mixture to clean wood and laminate floors. Add a 1/2 – 1 cup of white vinegar to your laundry to soften and eliminate bad odors. Vinegar is particularly helpful at removing mildew, such as from damp towels or when you forget clean laundry in the washing machine overnight. Spray vinegar diluted with water as a pre-treatment on clothing to help eliminate body odor. After a number of uses, your dishwasher may get to smelling funky. Pour a cup of vinegar in the bottom of your dishwasher before running it to help eliminate odors and mildew in your dishwasher and washer drain. As an added benefit, it will help make your dishes brighter and eliminate spots. These tips are a sample of the many ways one can use vinegar to clean up around the house. Vinegar often cleans better than other chemical solutions. Keep a jug on hand to use for cleaning needs. Maid For Portland uses a wide variety of natural cleaning supplies to help clean your space without harming our environment. Contact us to schedule an estimate or book services.